Ready to unlock the full power of innovation in corporate real estate? SAP launched its top event of the year, SAPPHIRE NOW 2017, with Bill McDermott’s keynote “The Urgency of Doing” this Tuesday morning. The biggest news on the day was undoubtedly the relaunch of SAP Leonardo – SAP’s mark in the world of the digitally connected world of everything and everyone, based on tech foundations such as Machine Learning, Analytics, Big Data, Cloud, and IoT. Prior to this keynote, SAP Leonardo only encompassed the company’s IoT portfolio, while now providing SAP customers a unified and simplified commercial selection and holistic digital innovation system that seamlessly integrates future-facing technologies and capabilities into the SAP Cloud Platform, using SAP’s Design Thinking services. The new SAP Leonardo will be SAP’s digital brand — a digital innovation system that enables customers to rapidly innovate and scale that innovation to redefine their business for the digital world. 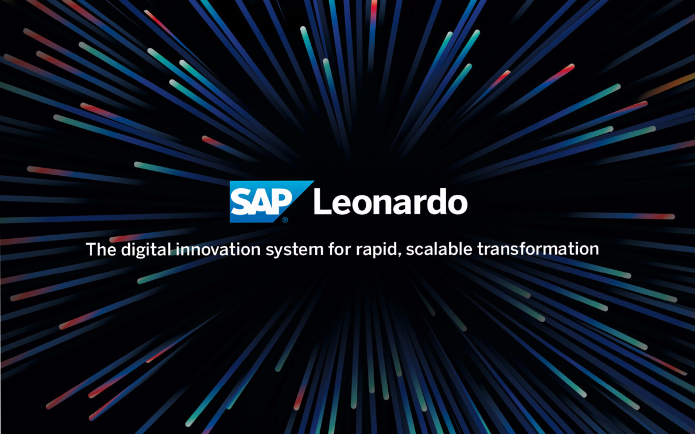 Like the artist and scientist Leonardo DaVinci, who centuries ago designed solar power and flying machines, SAP Leonardo applies the force of digital technologies to the power of imagination to reinvent new business models, and enable business leaders to envision their future. So, let’s take a closer look at exactly what SAP has in store with their newly branded innovation portfolio and how it was demonstrated in the lime light. Mala Anand, president of SAP Leonardo, Data & Insights at SAP, took the stage with CIO Juergen Mueller “to put all the buzzwords into context” as the German native put it. 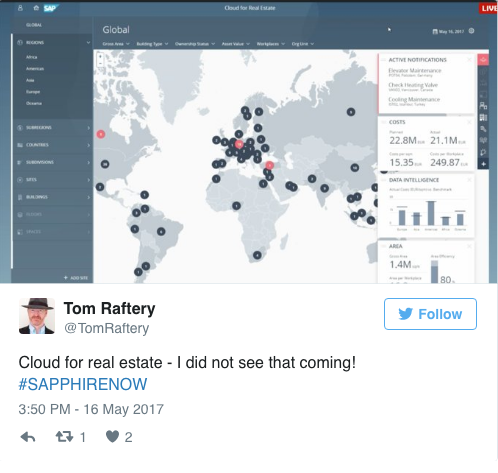 The solution, running on SAP Cloud Platform, was developed in Design Thinking workshops with customers and centralizes data from and for global building portfolios – data hailing from financial systems, sensors, external benchmarking, location metrics, maintenance history, ownership details, partner applications and many more – and in multiple languages. The solution simplifies managing corporate real estate and was “doing it the smart way”, Juergen stated. In the spirit of SAP’s new innovation portfolio, SAP Cloud for Real Estate connects all of the forward-thinking technologies mentioned in the image above on one single platform, the SAP Cloud Platform. Machine Learning is used for data abstraction in lease contracts, Blockchain helps to have a centralized register for multi-party processes, IoT provides data from sensors, while Analytics, Big Data and Data Intelligence help to collect and structure all building-related data from global real estate portfolios for helping corporations in making smarter decisions. “We are highly committed to building a robust partner ecosystem for SAP Leonardo”, Mala writes in “The New SAP Leonardo: Empowering Companies to Digitally Transform at Scale” and so does the team behind SAP Cloud for Real Estate. In the demo, the flexible integration possibilities were demonstrated by partner solutions LEVERTON and NavVis and more partners are to come and join the family this year. Besides powering customers’s and partners’ “new applications and make existing applications more intelligent, we will also use SAP Leonardo to make every SAP application more powerful, more intelligent, and more capable for our customers”, Mala says. With SAP Cloud for Real Estate you can already embark on this digital journey and make your real estate operations run simple, as of now. Couldn’t make it to Orlando? Learn how SAP Cloud for Real Estate will help you run your corporate buildings in a simple way, and start realizing the power of the future, today. Reach out to rethink.real.estate.management@sap.com for more insights and get a personal demo!